Battling with roof repair can be quite daunting at times with so many options available. Finding the best emergency roofing repair and reliable contractors can be relatively confusing, and it could often hamper your final decision. Having numerous options in your hand will ask you to act vigilantly so that you could know which one is the perfect for your needs. There are various factors to consider while choosing a reputable contractor. 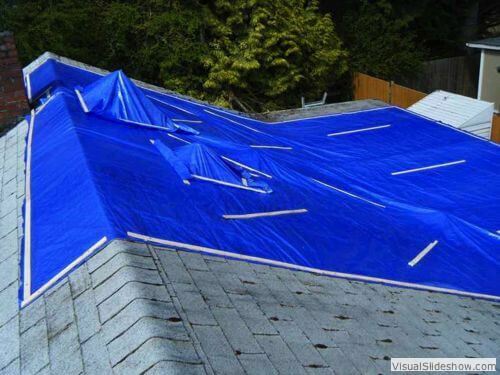 A repair done in an emergency is usually a temporary fix such as a protective cover or a tarp of the urgency of the affected area, with the purpose of preventing the water from finding its way inside the house. Such an emergency roof repair needs to be followed by a more permanent one, but it is essential to saving your assets and probably the structure of your house itself. It is important to know that you can do roof repair yourself. There are many methods to make reparation a hole or a leak with things you have available, but you always have to keep in mind such fixes are only temporary. You must call a professional roofer and have your roof repaired properly, otherwise, the next storm or heavy rain will break into your house again. While selecting the contractor, you must consider the quality of material they supply or use to accomplish the task. As you already know that there are numerous service providers in the market offering services at relatively low cost, but when it comes to the satisfaction of customers, only a few meet the requirements. Therefore, the first thing is to know about the quality of services offered while looking for any roofing contractor in your area. The roof is the largest structure of any establishment which has to withstand severe climatic conditions, so the material used in the construction must be good enough to satisfy your requirements. Most of the people ignore this fact while looking for emergency repair services and as a consequence end up losing a big amount of money. Budget is yet another important factor to put into consideration while hunting for services regarding emergency roofing repair. As it has already been discussed that some of the service providers offer services at very low cost, but the quality is not guaranteed; therefore, finding a service provider ensuring quality is of utmost importance. Online searches would bring you good results as you can compare the rate list and services of all of the contractors working in your area. Furthermore, you can also go through the reviews to find about the quality of services delivered. It will help you find right roofing professional for your assistance. You can also filter your searches by counting on the experience hold by the professional companies. Any contractor with years of expertise in the industry can be reliable enough to entrust the task to. Maintaining expertise in the area, he can improve the aesthetics as well as the quality of the roof; thus obtaining the best results for emergency roofing. those things can really help you to find a great roofer in your area. If you are looking for an emergency roofing repair in Memphis, Tennessee you come to the right place. Not only we fulfill the above criteria but also we are known for providing brilliant services. call us today to get a free roof inspection and we will make sure to give you the best possible services in the market today.